The gate keeper's house is in private occupation. Notes: The York - Market Weighton line opened on 4th October 1847. A level crossing was provided on Feoffee Lane which runs south west from Yapham village. The crossing keeper's house was similar in design to station houses and crossing keepers’ houses on both the Selby to Market Weighton and York to Market Weighton lines. It was a two-storey brick building with twin gables and a recessed central section between the two wings. The York & North Midland Railway became part of the North Eastern Railway in 1854, and the following year a new station called Yapham Gate opened at Yapham Gate level crossing, although the road was still named Feoffee Lane. The station first appeared in public timetables in February 1855. It was, however, short-lived and last appeared in timetables in April1865. Presumably the crossing keeper's house also acted as the station building. Prior to the building of railways, farmers in the East Riding of Yorkshire had to rely on water transport to get their produce to market. The rivers Humber and Ouse, linking York and Selby with the docks at Hull, had always been navigable, and the River Derwent was made navigable by an Act of 1701. The Market Weighton Canal running south from Market Weighton to the Humber estuary opened in 1778; the Pocklington Canal running west from Pocklington to the River Derwent opened in 1818. It was not long, however, before the arrival of railways would ensure the rapid decline in waterborne transport in the area. The Leeds & Hull Railway Company was formed in 1824 with George Stephenson appointed as engineer. He proposed three inclined planes to be worked by three stationary engines for the hilly route out of Leeds, but the remainder of the line was very nearly level. This L&HR was one of a number of contemporary projects aimed at linking the east and west sides of northern England. The Leeds & Hull scheme soon stagnated, due in part to the stock market crash of 1825. In the meantime, the Knottingley & Goole Canal opened in 1826, turning Goole into a viable transhipment port for Europe. The growth of Goole as a port to rival Hull was sufficient to spur the Hull-based shareholders of the Leeds & Hull railway into action. At the end of 1828, they motioned that the railway should be built as far as Selby, with the remainder of the journey to Hull being made by steam packet, most importantly, bypassing Goole. The shareholders passed the proposal at a general meeting in Leeds on 20th March 1829, and the Leeds & Selby Railway Company was formed. The shortened line from Leeds to Selby was resurveyed by James Walker in 1829; he reported that the stationary engines were not required, with tunnels and cuttings being built in their place. Despite strong opposition from the Aire & Calder Navigation, who had a practical monopoly on transportation in the area, a Bill was passed by Parliament on 29th May 1830 allowing construction of the double-track line. By 22nd September, a single complete line of track had been built, and the railway was officially opened to passengers from a temporary terminus adjacent to the quayside at Selby. Both lines were complete by 15th December 1834, on which date the railway began to take goods traffic. In 1835 George Hudson formed a committee to promote a line to be known as the York & North Midland Railway, which was incorporated in 1836. This proposed line would join the North Midland at Normanton, a few miles east of Leeds, and it received its Act of Parliament in 1837. The first section of the Y&NMR opened on 20th May 1839 between York and a junction with the Selby line at Gascoigne Wood, with the remaining section to Normanton opening on 1st July 1840. A spur to Methley Junction, giving access to Leeds via a working arrangement with the North Midland, was opened on 27th July 1840, followed by a southbound curve from the Leeds & Selby at Gascoigne Wood. The line was extended southwards to Burton Salmon by 11th May 1840, with another short chord to the junction with the Leeds & Selby opening on 9th November 1840. During this period of 'Railway Mania' there were proposals to build 107 miles of new railway in East Yorkshire, not all of which would come to fruition. One of these schemes was for a line between Selby and Driffield via Market Weighton, while another line from York to Beverley would also pass through Market Weighton. Although four lines into Market Weighton were eventually completed separately, George Hudson’s York & North Midland held powers for a complete route from York to Hull which was authorised by an Act of 18th June 1846, including a requirement that the line should be completed within five years. On the same date the Y&NMR. (East Riding Branches) No. II Railway Act authorised the building of a 22-mile single-track line from the Hull & Selby line to Market Weighton. Running across flat open ground with 22 level crossings, the line would have no major engineering features apart from a bridge over the River Derwent at Bubwith. The contractors for both lines were Messrs. Jackson and Bean with stations built by Burton & Son. Construction started on 12th August 1846, and the board expected completion on 30th September 1847 – they were out by only four days. It was hoped the Selby line would open two months later, but it was delayed, eventually opening on 1st August 1848. The double-track York line opened to Market Weighton on 4th October 1847. At that time the only intermediate station shown in timetables was Stamford Bridge. Additional intermediate stations at Huntington, Stockton, Gate Helmsley, Fangfoss, Pocklington, Burnby and Shipton may have opened with the line. There is documentary evidence that Gate Helmsley and Burnby were open by June 1848 whilst the other stations first appeared in Bradshaw in July 1848. There were two further stations, both short-lived: Yapham Gate, between Fangfoss and Pocklington, first appeared in Bradshaw in February 1855 and last appeared in April 1865, and Londesborough Park, a private station for George Hudson between Shipton and Burnby, might have opened with the line and closed in January 1867. Initially three trains ran daily in each direction between York and Market Weighton, with two trains between Selby and Market Weighton. It was suggested that by juggling the timetable only one locomotive would be required to run both services - but this could not be achieved. By 1850 one of the Selby trains started at Pocklington on the York line, after a petition for better market travel facilities, which resulted in a general market ticket scheme from April 1851. The York line failed to live up to expectations. In August 1850 the directors heard that receipts at Huntington barely exceeded the stationmaster's wages, and there was a proposal to close the station. This did not happen, although there were some redundancies in an attempt to save money, and there was a proposal to single the line as early as 1853- while the doubling of the Selby line started in 1889. The stations on the York line eventually suffered heavily from the North Eastern Railway policy of renaming, which avoided any possibilities of confusion, but resulted in many stations conveniently situated for a particular village receiving the name of one much further away. Huntington became Earswick, Stockton turned into Warthill, Burnby to Nunburnholme, and Shipton to Londesborough. From its opening Market Weighton had been a terminus, but it was always intended that the York line should be extended south to Beverley, and the Selby line east to Driffield. The extension to Beverley proved problematic due to the routing of the line across the Dalton Holme Estate. By this time the Y&NMR were in financial difficulties, and they argued that there was now little public demand for the line. This view angered local people and, when the Y&NMR became part of the North Eastern Railway in 1854, the company found itself under the local pressure to complete the line. There was much debate, which included a proposal to build a completely new line from Market Weighton to Brough. In 1860 the NER eventually agreed to build the line to Beverley as originally planned, and an Act was granted on 30th June 1862 with work starting in September that year. Progress was slow and, in 1864, the directors were trying to decide whether to provide an intermediate station at Goodmanham to the east of Market Weighton as well as Kipling Cotes (serving little more than a couple of farms) and Cherry Burton – Goodmanham was not built. The single-track extension opened on 1st May 1865, and a new revised timetable was immediately introduced with four stopping trains from York to Hull completing the journey in two hours. There was also a fast service that called only at principal stations. The NER began a programme of doubling the line in 1899 with a second platform being provided at the two intermediate stations. At this time the NER had no plans to extend eastward from Market Weighton to Driffield but, after several failed proposals, the Scarborough Bridlington & West Riding Junction Railway began building a line between Driffield and Market Weighton in 1888, having secured an agreement to work the line with the North Eastern Railway. The line opened to passenger traffic on 21st April 1890, having opened to goods traffic some weeks earlier. Following the 1923 general grouping, the LNER improved the service on both the York and Selby lines. In 1925 there were eight daily trains between York and Hull and seven in the opposite direction; not all trains called at all stations. There were two additional Saturday workings between York and Pocklington which were used to trial a new petrol rail car. One was in the morning and the other in the evening, but only the outward journey to Pocklington in the evening carried passengers. While the Market Weighton to York service still carried a reasonable number of local passengers, many of the stations on the Selby line were little used and had all closed by 20th September 1954. A limited passenger service between Selby, Market Weighton and Bridlington was retained, until final closure of the line to all passenger traffic was proposed for 15th June 1964. An appeal was rejected and the service was withdrawn on 14th June 1965. With the closure of Holme Moor and Everingham goods depots on 2nd August 1965, the whole route was completely defunct. On the York line, the position was rather different. Holtby station closed at the start of WW2 and Nunburnholme closed in 1951. In June 1950 there were eight daily journeys between York and Hull with seven in the opposite direction. Through the 1950s there was some modernisation. Lifting barriers (the first in the country) were installed at Warthill in 1953, and coloured light signalling was installed at Market Weighton and near Stamford Bridge. Steel sleepers were laid between Market Weighton and Kipling Cotes. Warthill, Fangfoss and Cherry Burton closed in 1959. The introduction of Cravens diesel multiple-units saw a general speeding up of the service, with nine trains per day calling at the remaining stations. The accelerated service proved popular, but this upturn in fortunes was to be short-lived. In May 1961 a contract for further modernisation work on the route was agreed with the engineering firm Westinghouse. Within weeks the first consignments of equipment were being delivered to Pocklington. The main part of the plan was to reduce costs further by singling the track but providing passing loops at Pocklington and Market Weighton. The line would be operated from a Centralised Traffic Control installation at Bootham Junction, York. Work was also to include the conversion of 19 of the line's 22 remaining gated level-crossings to automatic half-barriers and an overhaul of the signalling system, allowing the whole route to be controlled from fewer signal boxes. Very little work had been carried out before the modernisation scheme was suddenly halted in February 1962, with British Railways announcing that the plans had been suspended for "re-assessment". What was happening became clear on 27th March 1963 when Dr. Richard Beeching released his report. The York to Beverley route was earmarked for closure, and was one of only three lines in the report to be presented as an economic case study. Beeching considered that closure was justified on the grounds that it was actually losing money when all the "terminal costs" were taken into account, and that closing the seemingly-profitable line would create greater savings that were more beneficial than the income it was making. He also argued that the majority of passengers were simply travelling between York and Hull, and that intermediate stations were underused. This made the line an unnecessary duplicate of the Hull to York Line (via Selby) despite the fact that the more direct line was far from underused. By 1964 all the goods yards had been closed, with the exception of Market Weighton and Pocklington where a small amount of traffic was still handled. The election of a Labour government in 1964 appeared to throw the route a lifeline, but Harold Wilson quickly backtracked on his electoral promises to halt rail closures. Protests from local authorities along the route and concerns of the official railways watchdog were ignored, and the Transport Secretary, Barbara Castle, approved the closure. The final trains ran on Saturday 27th November 1965, the very last being a six-car DMU running the 9:42 p.m. from York to Hull. Despite the snow, the train was packed with local people and enthusiasts eager to travel on the last train. Passenger services officially ceased as from 29th November 1965. The Minister's consent caused widespread bitterness. Critics of the closure claim that if the C.T.C. scheme had been revived it would have paid for itself in seven years and, thereafter, have permitted an annual profit of some £7,000. It also appeared that was an error over the alleged losses as, at the public inquiry, the British Railways Board stated these had been reduced by dieselisation and improved working to some £11,000. Yet the Ministry spoke of an annual deficit of some £100,000; a gentleman at Pocklington (who organised a protest) wondered, quite seriously, whether some secretary typed one naught too many. Four years after closure all the lands and assets of the mothballed route were sold off by British Rail, mostly to local landowners and developers, resulting in the construction of houses on parts of the route in built-up areas. Nonetheless the majority of the trackbed and several railway buildings survive to this day. Pocklington station (a Grade II listed building) has been preserved and is now the sports hall of Pocklington School. In Stamford Bridge the station house and engine shed survive in other uses as do the platforms on both sides of the old trackbed. The impressive brick and cast-iron viaduct at Stamford Bridge that carried the line across the River Derwent was spared from demolition in 1991 and subsequently repaired. Other railway and station buildings still survive in good condition at Warthill, Holtby, Fangfoss, Nunburnholme, Londesborough, Cherry Burton and Kipling Cotes. The 11-mile long Hudson Way footpath and cycleway follows the course of the line from Market Weighton – Beverley, with a car park at Kipling Cotes station. 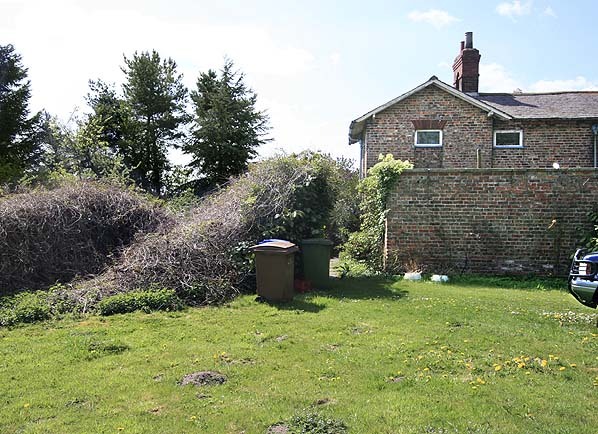 The substantial station buildings at Market Weighton were left abandoned before being pulled down in 1979, leaving no trace. Earswick was the only other station on the line to be totally demolished, although its position is marked by a railway signal outside the pub that now occupies the site. The continuation of the line from Beverley to Hull was spared from closure and today forms the southern end of the Yorkshire Coast Line between Hull and Scarborough. In recent years, there has been considerable public support among local residents for the reopening of the line between York and Beverley. There has even been campaigning to this effect, led largely by the Minsters' Rail Campaign pressure group who argue that the railway was unfairly closed and that East Yorkshire's roads, particularly the A1079, are struggling to cope with increasing traffic to and from Hull. A report by the Carl Bro Group for East Riding of Yorkshire Council in 2004 concluded that the project was feasible, but would cost around £239 million to build. The council subsequently gave their complete backing to the proposals, however no further developments have taken place. Due to British Rail's selling off of the line's assets shortly after closure, parts of the trackbed in localities including Huntington, Stamford Bridge and Pocklington have now been irreversibly re-developed for housing. If the line is ever reconstructed it would be impossible for it to follow the original route for its whole length. However, documents published in 2006 as part of the East Riding of Yorkshire Council's Local Development Framework Transport Development Plan suggest that new routes into and around these existing built up areas have been identified and safeguarded alongside potential sites for new stations. Additionally section Section 6.63 of the Council's Core Strategy Document (published for public consultation in spring 2008) states: ‘...it is recommended that land for the following strategic infrastructure and transport schemes be protected from conflicting development: Railways - Beverley to York railway route; and Rail links to employment land at Melton, Hedon Haven and Carnaby. (if allocated). Tickets from Michael Stewart, route map drawn by Alan Young. The site of Yapham Gate station in May 2010. This 1854 1:1000 OS map shows the crossing as Feoffee Lane. 1892 1:2500 OS map now shows the gatehouse as Yapham Lane.